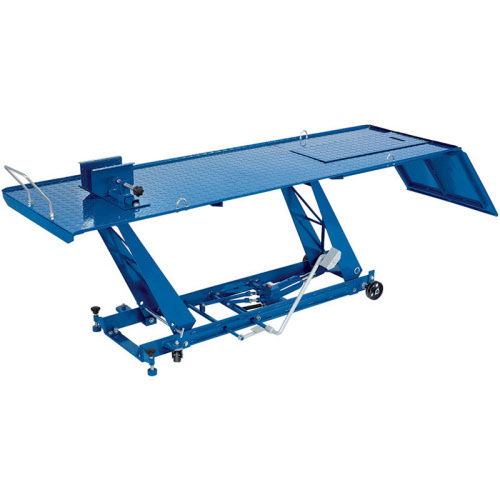 Draper Tools 450kg Hydraulic ramp repair bench Motorcycle Lift 37157 All steel construction with heavy duty foot operated hydraulic pump and ram assembly. Safety table lock device to prevent accidental lowering. Adjustable front wheel clamp and wheel stop bar. Removable rear panel to facilitate rear wheel changes. Base assembly fitted with transport wheels and lock downs to prevent lift from moving whilst in use. Table surface is stippled for safety and grip whilst loading motorcycles.